Set less than 20 minutes from Monaco, this hotel offers friendly atmosphere and typical Provençal setting and overlooks the Mediterranean Sea and the old citadel. The Le Provençal hotel features comfortable guest rooms with view of the sea or the village. Each room is air-conditioned and comes with a TV. Laze and unwind on the hotel’s terrace or relax and stroll in the quiet garden. Ideally situated, the Provençal hotel offers easy and quick access to the beaches of fine sand and allows you to discover the charming harbour and the narrow streets of the village set just a stroll away. Hotel La Flore is a 3-star hotel located between Nice and Monaco. It offers a panoramic view of the sea, free Wi-Fi access and free parking. Rooms are furnished in a Provencal style that combines traditional touches with modern comforts. Most rooms have a balcony with spectacular views out over the Mediterranean. The Hotel La Flore has a private bar, where a computer with free internet connection is available for all guests. Hotel La Flore faces south and overlooks the bay of Villefranche. It is on the bus route that serves the major coastal cities of the French Riviera. Located between Nice and Monaco, Hotel La Fiancée du Pirate overlooks the Villefranche Sur Mer bay and is across from Saint Jean Cap Ferrat peninsula. It offers a panoramic sea view. Rooms are comfortable, with queen or king-size beds. Some rooms enjoy a sea view while others have a terrace or garden. A buffet breakfast is served daily on the terrace facing the sea. Guests can relax by the hotel swimming pool where lounge chairs and towels are offered. The Hôtel La Fiancée du Pirate is an ideal base for exploring the nearby coastal towns of the French Riviera including Eze, St Paul de Vence, Nice, Antibes and Juan les Pins. The Welcome Hotel is situated in Villefranche-sur-Mer between Nice and Monte-Carlo. It offers air-conditioned rooms with a balcony overlooking Cap Ferrat Bay. Le Wine Pier, the Welcome’s wine bar, has a terrace with panoramic sea views and an extensive selection of local wines and cocktails. Additional services include a 24-hour reception and free daily international newspapers. The Welcome Hotel is 440 yards from the beaches, and there is a diving club in front of the hotel. The Hôtel Riviera Villefranche is located between Monaco, Nice and Cannes and offers comfortable and affordable accommodation. Recently renovated, every room is unique in their style and décor and feature standard rooms and slightly larger comfort rooms. 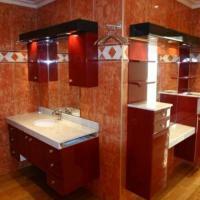 All rooms are equipped with modern en suite facilities and amenities. Wi-Fi internet access is available and is free of charge. Some rooms offer a sea view. Start your day with one of the best buffet breakfasts in town, served at the Hôtel Riviera Villefranche. In addition to comfortable, air-conditioned and smoke-free accommodation, the hotel also features a bar and 2 public car parks nearby. It is also just 5 minutes from the beaches and tennis courts. Ideally in Villefranche-sur-Mer, between Nice and Monaco, Hotel Le Versailles offers en suite room with panoramic views of the sea and a heated swimming pool. Free parking is available on site. Each of Hotel Le Versailles’ rooms is air-conditioned and has a balcony opening into the Riviera. They all have an LCD TV and telephone, and some of them also have free Wi-Fi internet access. Breakfast is served each morning and Le Versailles’ restaurant has delicious Mediterranean cuisine. This Pierre & Vacances residence has an outdoor swimming pool and terrace overlooking the sea in Villefranche-Sur-Mer. It is a 4 mile drive from Nice and 330 yards from the beach. The Résidence offers studios and apartments with a balcony or terrace, satellite TV, and private bathrooms. They also have a fully equipped kitchen, including a dishwasher and electric coffee maker. Guests of the Résidence Pierre & Vacances L'ange Gardien can relax in the hotel’s tropical garden and enjoy Water sports in Villefranche-Sur-Mer. The 18-hole golf courses at The Monte Carlo Golf is 8 miles from the L'ange Gardien and guests can also enjoy tennis, horseback riding and thalassotherapy nearby. 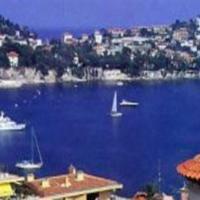 Hotel Patricia is a 5-minute walk from the beaches of Villefranche-sur-Mer. It offers a Jacuzzi and rooms with sea views, TVs and free Wi-Fi. The hotel has a covered terrace opening onto a secluded garden. There is also a beauty salon for guest use. The hotel is 1.5 miles from Saint-Jean-Cap-Ferrat and less than one mile from Beaulieu. Nice is 5.5 miles from Hotel Patricia and a private parking lot is available. Facing the marina, Hotel de la Darse offers rooms overlooking the Villefrance-sur-Mer bay. The hotel has a spacious terrace and grounds. The spacious guest rooms have a modern decor. The large floor-to-ceiling windows offer plenty of natural light and some rooms feature a balcony overlooking the sea. All rooms are equipped with a TV and free Wi-Fi access. Guest can relax on the large terrace planted with exotic plants. Every morning a continental breakfast is served. Nice-Ville station is only 20 minutes away and Nice Cote d’Azur Airport is only a 28-minute drive away. Free public parking is available on site. Located 5 minutes from Villefranche sur Mer and its beaches, this residence is on a 13-hectare domain with fountains and art work, panoramic sea and mountain views, and 2 outdoor pools and a hot tub. Each villa, suite and studio at the Domaine du Mont Leuze has a balcony with views over the garden, a flat-screen TV and a private bathroom. Some villas and suite have a fully equipped kitchenette. A continental breakfast is served daily in the dining area or out in the garden. Other facilities guests have access to in the residence include 2 tennis courts and a sport’s room. Free public parking is provided. The residence is a 10-minute drive from Nice and a 20-minute drive from Monaco. Located in the centre of Villefranche-sur-Mer, this hotel is a 10-minute walk from the town’s beaches and port. It offers free Wi-Fi and an on-site bar with a terrace. The guest rooms at Hotel La Regence are bright and some feature a view of the sea or gardens. Each of the rooms is equipped with an en suite bathroom offering complimentary toiletries upon arrival. Guests can enjoy a continental breakfast served each morning at the hotel. In the evening, guests are invited to relax on the terrace with a drink when the weather is nice. The hotel is located a 10-minute drive from Villefranche-sur-Mer Train Station and a 15-minute drive from Nice Côte d’Azur Airport. Monte Carlo is a 20-minute drive away. Apartment Les Oliviers is just 1 km from the beach and the centre of Villefranche-sur-Mer. It offers a south-facing balcony with panoramic sea views, and free access to a swimming pool and tennis court. The apartment also includes 2 bedrooms and a large living area with a dining table. Kitchen facilities include 4 hotplates, a microwave and a dishwasher. A washing machine is provided. Private parking in garages is available on site and with an extra cost. Other local activities include driving the 10 minutes to Nice or visiting Monaco, which is 15 km from the property. 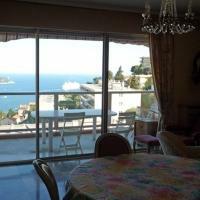 Apartment L'Ange Gardien Villefranche sur Mer is just 150 metres from the beach and 1.5 km from the town centre. You will have free access to the resort’s swimming pool, playground and on-site bar. The apartment features a large south-facing balcony with panoramic views of the sea, mountains and swimming pool. There is a TV in the lounge and a bath in the en suite bathroom. Kitchen facilities at Apartment L'Ange Gardien include 4 hotplates, a grill and a freezer. A washing machine, dishwasher and ironing facilities are also provided for your convenience. A limited amount of private parking is available on site and with an extra cost. Other local activities include driving the 8.5 km to Nice or visiting Monaco, which is a 15-minute drive from the apartment. Located in the centre of Villefranche-sur-Mer, a 20-minute ride from Monaco, On Villefranche Bay offers a self-catering apartment with views of the bay of Villefranche-sur-Mer, and free Wi-Fi throughout. 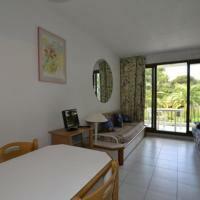 The apartment at On Villefranche Bay features a flat-screen TV, a wardrobe and individual heating. It also includes a private shower and toilet. The fully-equipped kitchen offers a coffee machine, microwave and oven. A toaster and refrigerator are also provided. Set a 20-minute ride from Nice, On Villefranche Bay dates back to the 16th century, and the apartment is on the first floor. Nice: Residence "La Quieta". In a sunny position on a slope, 500 m from the woods edge, 2 km from the sea. For shared use: swimming pool (17 x 7 m, depth 80 - 210 cm, 01.05.-30.09.). In the house: lift. Shop, restaurant 500 m, bus stop 50 m, shingle beach 2 km. Golf course (18 hole) 25 km. >. Residence "La Quieta". 500 m from the woods edge, 2 km from the sea. For shared use: swimming pool (17 x 7 m, depth 80 - 210 cm, 01.05.-30.09.). In the house: lift. Shop, restaurant 500 m, bus stop 50 m, shingle beach 2 km. Golf course (18 hole) 25 km. 2-room apartment 65 m2 on 3rd floor, flat screen TV. Exit to the terrace. 1 room with 1 double bed (140 cm). 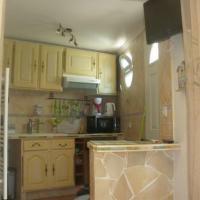 Kitchen (4 hotplates, oven, dishwasher, micro wave, freezer, electric coffee machine). Bath/shower, sep. WC. Gas heating. Terrace 12 m2, south-west facing position with terrace furniture. Appartement Le Villefranche is a self-catering apartment in Villefranche-sur-Mer, just 500 metre from the beach and a 5-minute walk from the harbour. The 2-bedroom apartment offers free Wi-Fi and a balcony with a city view. Satellite TV and a lounge area are provided in the light and airy living room, and a washing machine is at your disposal. The open plan kitchen is fully equipped and the bathroom is fitted with a shower. Shops, bars and restaurants are found in the surrounding area and Villefranche-sur-Mer Train Station is 650 metres away. The property is 6 km from central Nice, 3 km from Cap Ferrat and 12 km from Monaco. Located in a villa in Villefranche-sur-Mer, Appartement Charme et Cœur is a 2-minute walk from the city centre and a 15-minute walk from the beach. It offers sea views, a terrace and wired internet access available throughout. The air-conditioned apartment features a living room with TV, a bathroom with shower and a fully equipped American kitchen with microwave. Shops and restaurants are 500 metres away. Guests can drive 10 km to Monaco or 8 km to visit Nice. Saint-Jean-Cap-Ferrat and Villefranche harbour are 1.5 km away. Nice-Côte d’Azur Aiport is 15 km away, while Nice Train Station is 8 km away. Located in Villefranche-sur-Mer, Petit Coin de Paradis Entre Nice et Monaco is set within a flowered park and offers an outdoor swimming pool with panoramic views. The beach is only a 15-minute walk away. The air-conditioned studio with free wired internet access features a terrace with garden views, a living area, a wardrobe, a washing machine and a bathroom. The kitchenette includes a microwave, dishwasher and refrigerator. Additional features include a laundry room, sun loungers and free private parking. Monaco is a 20-minute drive away and Nice is only 7 km from the property. Located in Villefranche-sur-Mer, Appartement l'Eglise is a self-catering apartment, just 500 metres from the beaches and 100 metres from the marina. It is air-conditioned and offers free Wi-Fi access. 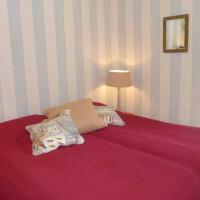 Appartement l'Eglise features a living room with a sofa bed and a satellite TV, a bedroom and a private bathroom. You can prepare meals using the apartment’s kitchen, which is equipped with an oven, fridge, coffee machine and toaster. 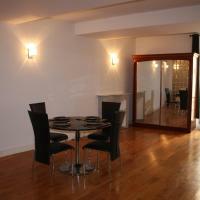 Restaurants and shops can be found 200 metres from the apartment. Just 6 km from Nice, Riviera Best Of Nice VilleFranche Sur Mer features a self-catering villa with outdoor, heated swimming pool and tennis court. It offers panoramic sea views and free Wi-Fi. The four-bedroom villa has 2 bathrooms with shower and bath, a living room with flat-screen TV and DVD player and a terrace with sea views. The kitchen is fully equipped with oven, stove and microwave. BBQ facilities are also provided. Guests will find shops and restaurants 1 km away. They can go to the beach in Villefrance-sur-Mer, 3 km away or can drive 5 km to Eze and its botanical garden. Monaco is a 15-km drive away. Villefrance-sur-Mer Train Station is 3 km away, while Nice Train Station is 10 km away. Nice-Côte d’Azur Airport is 15 km away and access to A8 Motorway is possible 10 km away.